Our wide-mouth packers are ideal for all of your liquid and dry storage needs. 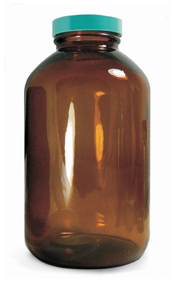 The amber borosilicate glass is ideal for storage of all light-sensitive materials. The closures are made of chemical resistant polypropylene with a solid Teflon (PTFE) disk liner which is suitable for chemicals and solvents and provides good tight sealing properties.